﻿For the first time, researchers led by Tufts University engineers have integrated nano-scale sensors, electronics and microfluidics into threads - ranging from simple cotton to sophisticated synthetics - that can be sutured through multiple layers of tissue to gather diagnostic data wirelessly in real time, according to a paper published online July 18 in Microsystems & Nanoengineering. The research suggests that the thread-based diagnostic platform could be an effective substrate for a new generation of implantable diagnostic devices and smart wearable systems. 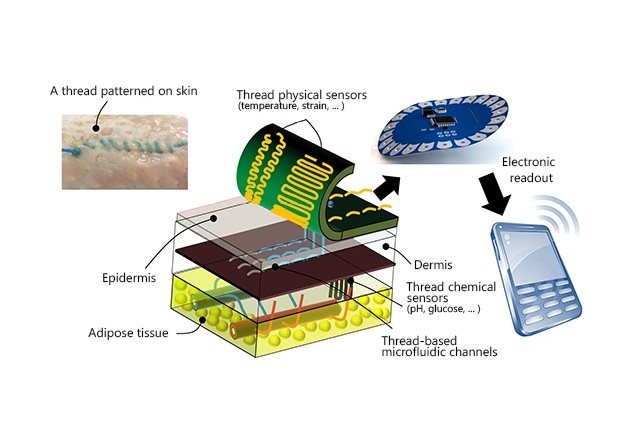 The researchers used a variety of conductive threads that were dipped in physical and chemical sensing compounds and connected to wireless electronic circuitry to create a flexible platform that they sutured into tissue in rats as well as in vitro. The threads collected data on tissue health (e.g. pressure, stress, strain and temperature), pH and glucose levels that can be used to determine such things as how a wound is healing, whether infection is emerging, or whether the body's chemistry is out of balance. The results were transmitted wirelessly to a cell phone and computer, and the three-dimensional platform is able to conform to complex structures such as organs, wounds or orthopedic implants. While more study is needed in a number of areas, including investigation of long-term biocompatibility, researchers said initial results raise the possibility of optimizing patient-specific treatments. "The ability to suture a thread-based diagnostic device intimately in a tissue or organ environment in three dimensions adds a unique feature that is not available with other flexible diagnostic platforms," said Sameer Sonkusale, Ph.D., corresponding author on the paper and director of the interdisciplinary Nano Lab in the Department of Electrical and Computer Engineering at Tufts University's School of Engineering. "We think thread-based devices could potentially be used as smart sutures for surgical implants, smart bandages to monitor wound healing, or integrated with textile or fabric as personalized health monitors and point-of-care diagnostics." Until now, the structure of substrates for implantable devices has essentially been two-dimensional, limiting their usefulness to flat tissue such as skin, according to the paper. Additionally, the materials in those substrates are expensive and require specialized processing. "By contrast, thread is abundant, inexpensive, thin and flexible, and can be easily manipulated into complex shapes," said Pooria Mostafalu, Ph.D., first author on the paper who was a doctoral student at Tufts when he worked on the project and is now a postdoctoral research fellow with the Harvard-MIT Division of Health Sciences and Technology, Brigham and Women's Hospital, and the Wyss Institute for Biologically Inspired Engineering at Harvard University. "Additionally, analytes can be delivered directly to tissue by using thread's natural wicking properties." Originally posted by Tufts University.